I mellomtiden forberedes salaten. Bland alle ingredienser til dressing. Ha salatblader, syltet ingefær, mango, rødløk og persille i en salatbolle. Bland i dressingen og løft forsiktig på salaten til alt er jevnt blandet. Legg på reddiker, skivet kyllingkjøtt og syltet chili. Season the chicken pieces with salt and pepper, brush with taryiaki sauce and sprinkle over some chili flakes. Apply oil to the bottom of a pan with a lid and warm on high temperature. Fry chicken fillets for 1-2 minutes. Turn the fillets and turn down the to the lowest temperature. Put the lid on and leave the fillets to cook undisturbed for 10 minutes. Set aside Meanwhile prepared the salad. Mix all ingredients for the dressing. Add salad leaves, pickled ginger, mango, red onion and parsley to a salad bowl. Mix in dressing and gently lift the salad until everything is evenly mixed. 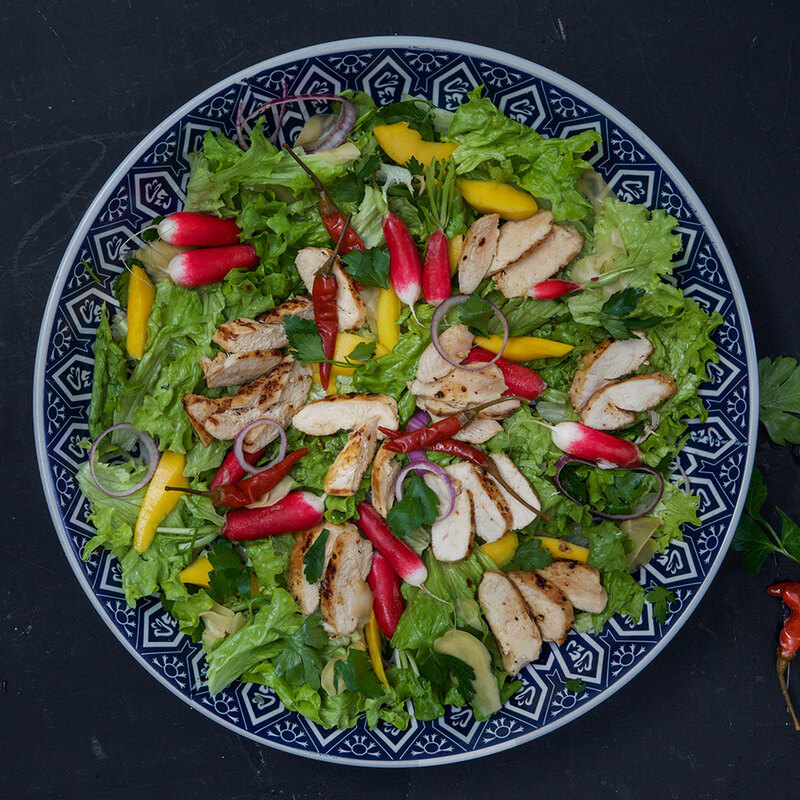 Add the radishes, sliced ​​chicken meat and pickled chili.